Beech trees are native to the eastern United States and southeastern Canada and grow well in USDA zones 4 to 9. European beech tree history is entwined with Celtic mythology, where its name is identified with Runic writing. The early English name for beech is identical with the word for book. 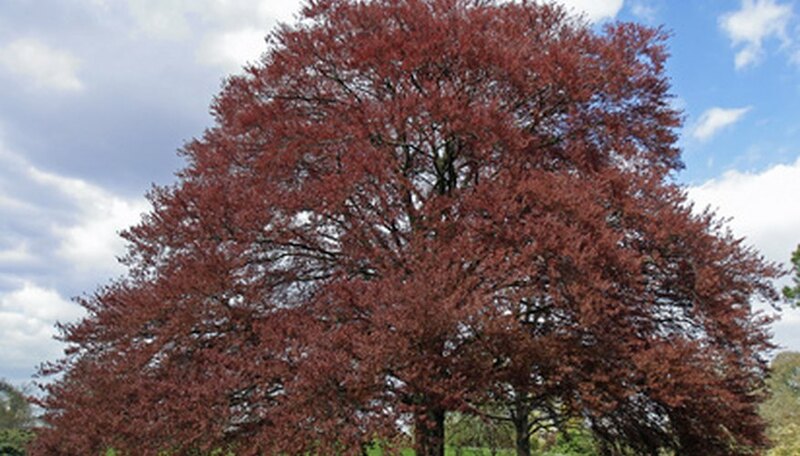 Beech trees in the U.S. have come under attack by the Beech bark disease since the 1930s. The tree produces edible nuts that are favored by birds and bears. The American beech tree (Fagus Grandiflora) is one of 10 species of deciduous trees in the family Fagaceae. Its bark is smooth and gray and foliage is dark bluish green above and light green below. Leaves are sharply and coarsely toothed with four to 14 pairs of veins per leaf. Leaves are leathery in texture when mature. Beech trees reach 80 feet in height and have a 70-foot-wide spread when growing in open space. They are shade tolerant but thrive in full sun. Trees need 18 nutrients to support healthy growth. A regular schedule of fertilizing beech trees encourages vigor and supports resistance to disease. A strong tree is able to repel harmful insects and disease. The purpose of tree fertilization is to supply specific nutrients found to be deficient. Beech trees thrive in nutrient-rich soil with good drainage. Organic compost improves drainage and increases nutrients in soil. Synthetic fertilizer supplies trees and other ornamental plants with nitrogen, phosphorus and potassium. Content ratios are shown by the NPK label. Synthetic chemical fertilizers provide nutrients directly to the tree roots but do not support soil biological activity, known as the “soil food web." Organic compost regularly applied increases biological activity of the soil, which supports increased nutrient content for the tree. “Most shade trees exist in nature without much care, but transplanting trees into urban areas or man-made conditions can create problems,” according to the North Carolina University horticulture website. October through March are the best times to fertilize, but distressed beech trees should be fertilized at once. Apply fertilizer several feet from the trunk and again outside the drip line. Drill holes, feeding needles and surface application are the three most commonly used methods. Holes 10 to 12 inches deep, 3 feet apart are drilled in the ground around the beech tree and filled with compost fertilizer. Feeding needles are commercially available liquid fertilizer that is injected into the soil and spread by deep watering. Surface application is the simplest and fastest method to fertilize a beech tree. Broadcast compost in a circle around the tree beginning near the trunk, extending to the drip line.